Brad and Rachel Bell, pictured here with their twin daughters, still work hard since converting their business to a The Grounds Guys franchise, but they say their quality of life has improved thanks to the company’s systems. When Brad and Rachel Bell stopped at a trade show booth to snag a free bag at the GIE+EXPO in 2010, they never could have imagined that in less than a year they’d be franchise owners. But one thing led to another, and their chance introduction to The Grounds Guys landscape maintenance franchise system got the wheels turning for the Bells, who at the time owned Brad’s Lawn Service in Owensboro, Ky. The couple describes their previous business as challenging and overwhelming at times. Their greatest roadblock to growing their business, which was doing about $200,000 in annual revenue, was hiring and retaining employees. In fact, Brad Bell’s headaches were such that he was considering reverting to a one-truck operation and working in the field again. Not long after wandering into The Grounds Guys trade show booth, the Bells made a day-and-a-half trip to Waco, Texas, to visit the corporate headquarters of The Dwyer Group, The Grounds Guys’ parent company. “We learned about the systems and what they were bringing to the table to take our business to the next level,” Rachel Bell says. By spring of 2011, the Bells were officially The Grounds Guys of Owensboro, Ky.
Before encountering The Grounds Guys, the couple had never considered buying a franchise. 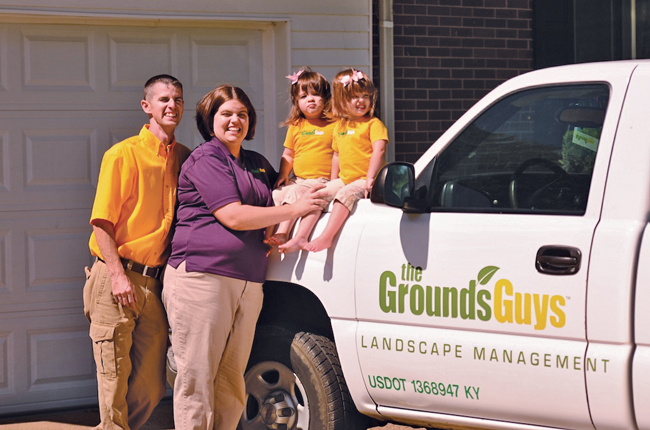 Today, The Grounds Guys of Owensboro, Ky., has grown 30 percent in two years, and is looking at hitting $350,000 in revenue in 2013. “I really feel like we started over,” Brad Bell says. For Brad Bell, the prospect of being a company with $1 million or $2 million in annual revenue is now within reach. Could he have gotten there before joining The Grounds Guys system? Now, Brad Bell “knows his numbers,” such as how much he needs to make per man hour to be profitable. And he has monthly sales goals he’s accountable for. Brad Bell says he didn’t have a system for hiring before becoming a The Grounds Guys franchisee, and now he has an effective six-step hiring process. Though the Bells still put in long hours, they’re happier with their quality of life. It’s allowed them more freedom, too. “If we want to go for a day trip or to The Dwyer Group’s national conference for three or four days, we have that freedom because of the systems in place and the crews in place,” Rachel Bell says. The Grounds Guys franchisees nationwide communicate with each other and the home office daily via Chatter, a social network within Salesforce, the customer relationship management software service the franchise uses. Not only do the Bells get ahead by asking their peers questions, they gain by sharing their knowledge, too. Brad Bell likes the friendly competition drummed up on Chatter. He’s motivated by the project pictures other franchisees post and when they share their successes, like landing a big job.